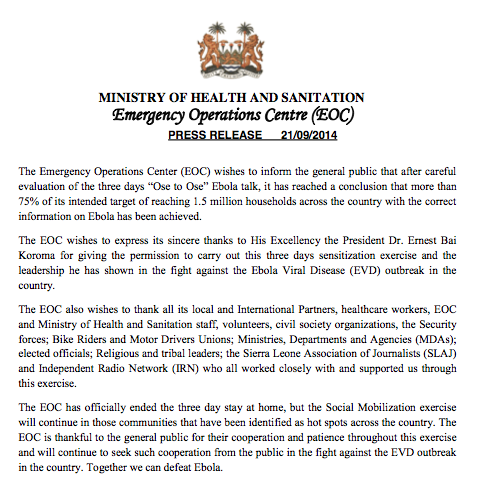 A few hours ago I received a report from the Ministry of Health and Sanitation, Emergency Operations Centre (EOC) in Sierra Leone - the Ebola House to House Sensitization Campaign is officially over. After 3 days of lockdown, people are no longer confined to their homes. There was a discussion about extending the lockdown since not all of the houses were reached, but it was decided to end the official lockdown and continue the house-to-house social mobilization exercise in the hot spot areas around the country. It's hard to know how successful a campaign like this was. It sounds like 75% of the households were reached nationwide, which sounds like a reasonable percentage in a 3 day period to me in a country with over 6 million people. Besides one incident in the East of Freetown, the nation was peaceful, which says a lot about people's willingness to cooperate and some trust in the government. From what I have heard, the quality of health talks varied but that's to be expected with over 21,000 volunteers with varying backgrounds and very recent training. I have heard that in some homes a bar of soap was given but little information about Ebola itself was provided and no questions were asked about sick people on the compound. In other homes, talks were more extensive and sick people were identified and taken to holding units. Hopefully overall, awareness increased. Although the main aim was raising awareness, suspected Ebola patients were also identified and dead bodies were also discovered. Of course, not all of the deaths will be due to Ebola. The campaign is over but the outbreak is not. It is important that the general public realizes this. There are often strange beliefs and already I have heard that some people think that Ebola is now gone. Also, a message was sent around today by a Bishop urging all citizens to call on the name of Jesus at 6 pm this evening to 'kick Ebola out'. From friends in the city, I heard that at 6 pm they did hear loud cries of 'Jesus, Jesus, Jesus'. Some people may well believe that this is all it takes. And while I believe that divine intervention is possible, I also believe that people need to be wise and sensible. Giving people hope is good, but not if it leads to people being careless. We need people to continue taking this disease seriously and move forward with extreme caution. There are still many challenges with sick people being too afraid to go to health facilities, health care workers not feeling protected enough to work, lack of beds in isolation/holding units and treatment centres, lack of staff, etc. It is also good to remember that many more people are now dying of diseases such as malaria, typhoid and pneumonia than they are of Ebola due to lack of general health care. There is still much to be done.